From the second you ride on the IDOL_LTD you will have a smile on your face. It feels absolutely neutral, doesn’t show any unwanted life of its own and is a feather in your hands so that you nearly forget about the sail during moves and maneuvers. This is one of the most important aspects especially for freestyle! It spins incredibly fast through all tricks even during the most difficult ducking moves and feels as if you rotate without a sail. The high clew and the short boom length excel at ducking so that no speed is lost. With the new IDOL_LTD the success rate of difficult maneuvers and the fun increases straight away making you automatically go for even more radical moves! Designer Kai Hopf has designed the IDOL_LTD for maximum efficiency. Compared to the regular IDOL it features a tighter leech, a reduced weight and a higher clew. Not only will maneuvers become much easier but also get performed at higher speed. This is due to the sophisticated profile distribution. 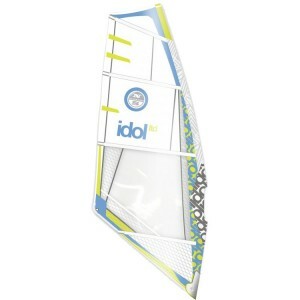 All of these aspects are apparent over a wide wind range and you will be surprised how large the trimming capabilities are on the new IDOL_LTD. Another important point: Even if other brands do not speak about it, we will tell the truth: ultra lightweight can only be achieved through the reduction of material thickness. Since the film thickness of the ODL laminate is reduced to the absolute minimum, the UV stability is limited. Therefore, this sail is excluded from the usual NorthSails 2+3.year.warranty!